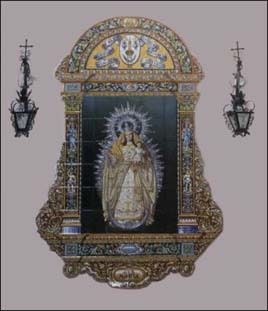 This is a picture of a pretty big ceramic tile image of the Virgin Mary. It's about 5 feet hight and 3 feet wide; it's 10 feet up high. You can see the full image by clicking on it. Below it, at hip level, there's a lonely tile, with a hole in it. If you look closely you can make out the word "LIMOSNA" (alms). My guess is in the past there was actually a box attached to it to collect alms for the church.